Research and understanding starts with data and documentation of evidence. 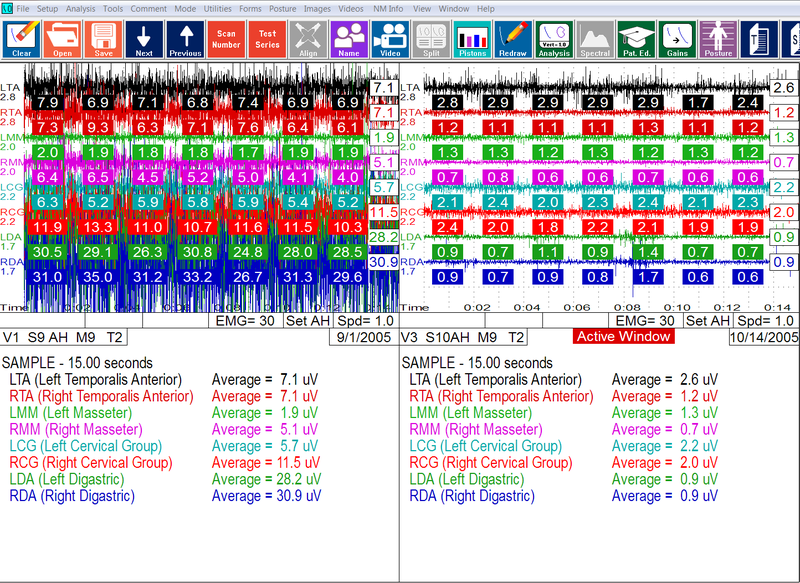 By recording before, mid and after treatment data the treating clinician can better learn what physiologic responses of his patient are working and what parts are not working. The prudent dentist will then further his study and treatment in a direction that respectfully addresses these responses to the masticatory system positively that will improve the patient’s health rather than by randomly and subjectively assuming certain procedures and modes of treatment he/she provides to the patient is OK.
MEASUREMENTS TELL US A LOT ABOUT THINGS WE WERE NOT AWARE OF PREVIOUSLY. The concept of “normal” is irrelevant and and often misleading in the field of dentistry and medicine. What some may consider normal may not be normal for others when evaluating mandibular jaw positioning and functional responses of opening and closing of the jaw. What some clinicians may consider normal may in actuality be abnormal (pathologic) when physiologic parameters used as a baseline to objectively measure and compared to physiologic norms. Without measured parameters in dentistry one will never know the many factors of whether the masticatory system (teeth, muscles, temporomandibular and CNS) are functioning optimally or whether there exists levels of impairment (dysfunction) when trying to re-establish maximum dental improvement (MDI) health. Is there any masticatory muscle dysfunction? Is there any presence of pain? Is there any joint derangement? 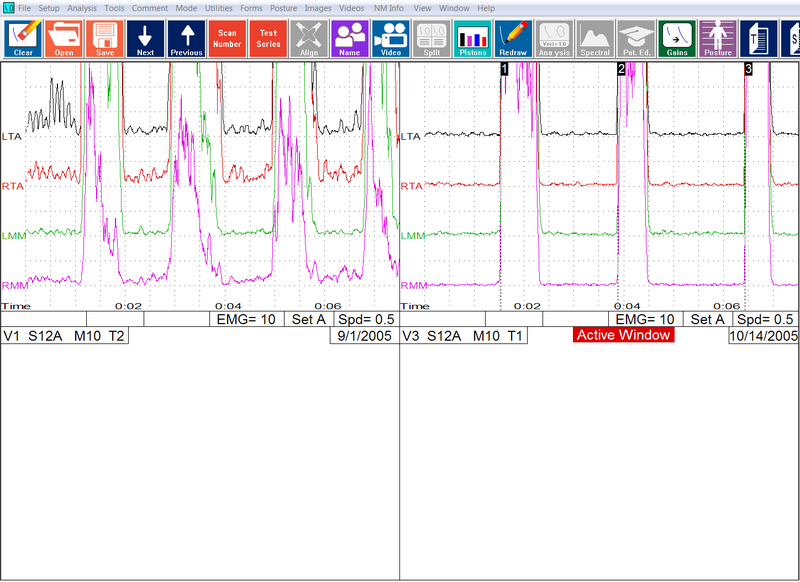 Habitual resting ability of the masticatory system before TENS – Scan 9 EMG (measures in mV). Functional recruitment ability of the masticatory muscles during clenching modes – Scan 11 EMG (measures in mV). 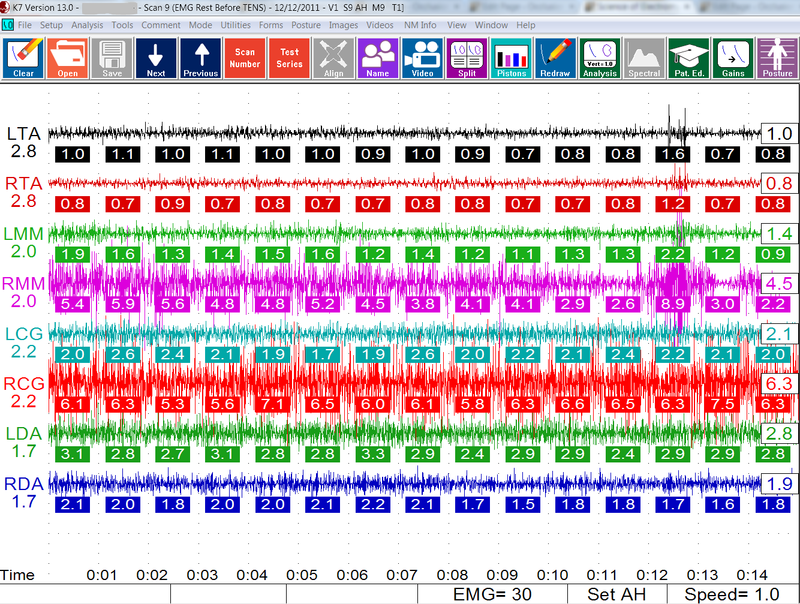 Quality of muscle balance timing during first tooth contact activity – Scan 12 EMG (measures in mV). Functional mandibular open and closing ability and speed before TENS – Scan 2 CMS (measures in millimeters and ms/second) – jaw tracking. 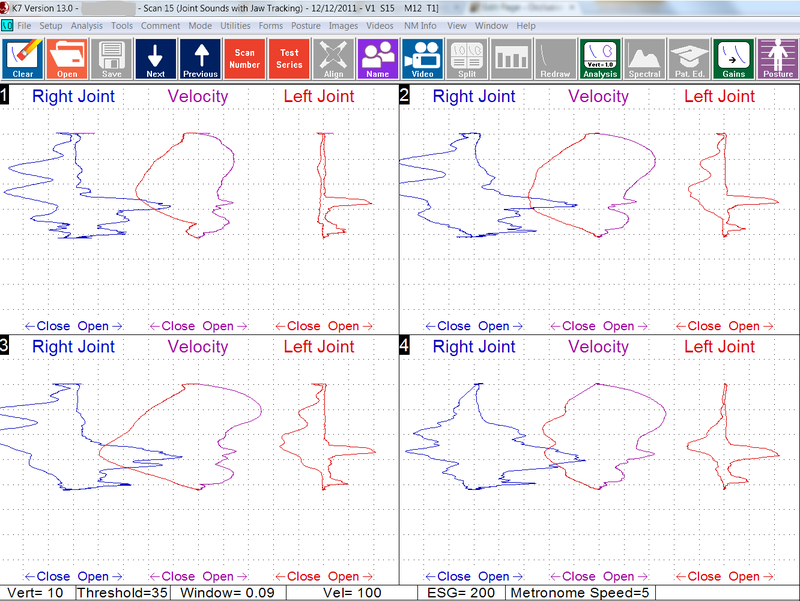 3 dimensional habitual resting freeway space before TENS – Scan 3 (measures in millimeters) – – jaw tracking. Swallowing patterns before treatment – Scan 6 (measures in millimeters) – jaw tracking. Functional chewing patterns before treatment – Scan 8 (measures in millimeters) – jaw tracking. Mandibular range of motion before treatment – Scan 13 (measures in millimeters) – jaw tracking. Joint sound analysis during functional mandibular open and closing cycles before treatment – Scan 15 (measures in millimeters and frequency levels) – ESG/jaw tracking. 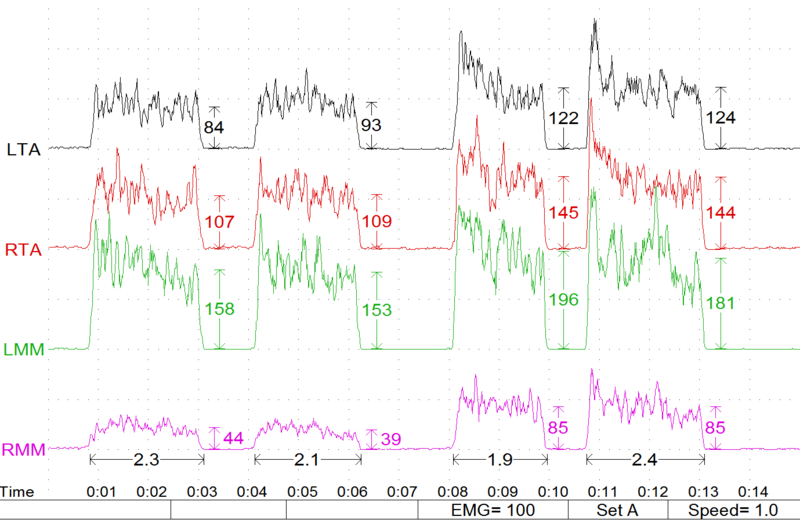 Habitual resting ability after TENS – Scan 10 EMG (measures in mV). 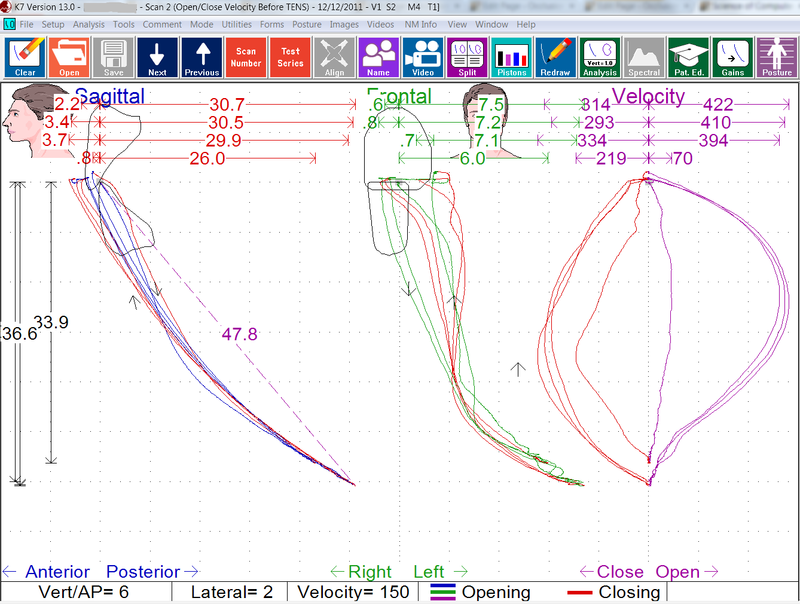 Habitual trajectory vs. Myo-trajectory mandibular jaw location relative to CO after TENS – Scan 4/5 (measures in millimeters) – jaw tracking. Functional mandibular open and closing ability and speed after TENS – Scan 7 CMS (measures in millimeters) – jaw tracking. Swallowing patterns after treatment – Scan 6 (measures in millimeters) – jaw tracking. Functional chewing patterns after treatment – Scan 8 (measures in millimeters) – jaw tracking. Mandibular range of motion after treatment – Scan 13 (measures in millimeters) – jaw tracking. CASE STUDY: (Male, 29 years old, presents with numerous musculoskeletal constrictions including stiff neck, retruded mandible (post 4 bicuspid orthodontics), tight throat and diminished voice complaints. 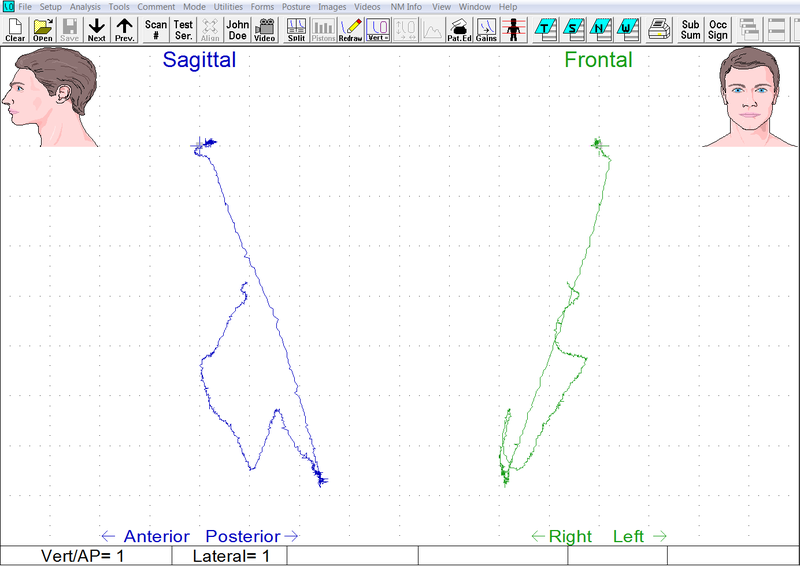 BEFORE ORTHOTIC CORRECTION: This is one type of “neuro-muscular” response with J5 Myomonitor TENS using computerized mandibular scanning (K7 Jaw Tracking). 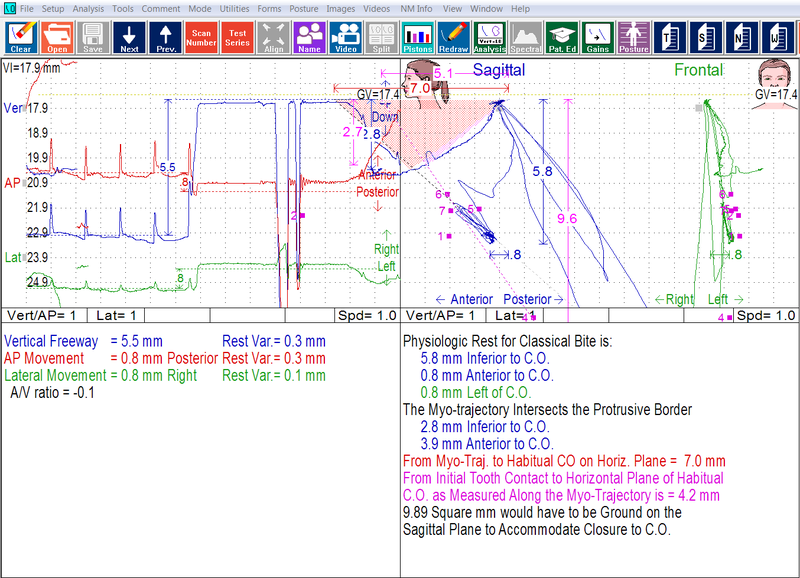 Note the vertical pulse pattern (blue), note the AP – antero-posterior pulse (red) and frontal/lateral (green) pulse pattern and movement of the mandible. Patient is instructed to relax their jaw. After 7 seconds patient is instructed to close his teeth together and tap 2 times and then relax. AFTER: Here is same TMD patient on same appointment visit AFTER ORTHOTIC correction adjustment. One can see two different “neuro-muscular responses”. Only with the use of involuntary TENS can one see these kind of real time neuro-muscular occlusal responses in both the vertical, AP and frontal/lateral mandibular movement abilities of his jaw. This is the power of the K7 Optimizing occlusal protocols and technique GNM style. Any of these tests can be performed before to determine quality and level of functional health (dysfunction and or impairment) exists prior to, during and or after treatment in determining whether maximal dental improvement has been achieved or not.